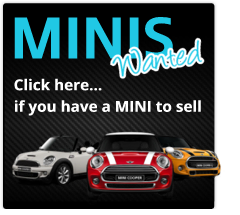 We have been established since 2008 and have progressed into the specialist independent retailer of used MINI cars that we are today. We are a privately owned Limited company (for clarification, we are not part of the Bayerische Motoren Werke AG (BMW) Group). We are set up and run by Tracey Hatton, who with her small team are based in Lightwater in Surrey. We work on an appointment basis from a converted farm barn, (think it was once known as “The Egg Packing Shed”) hence we have no fixed opening hours. We understand you have a busy life so we endeavour to work around your time schedule & we are happy to show you our MINIs daytime, evenings or weekends too. We believe our one to one approach enables our customers to have our undivided attention & that more than makes up for our lack of swanky offices, & sales men hovering, ready to pounce. It ensures you get our dedicated time making sure the MINI is exactly what you want & it means we are 100% certain we can do what we say we will do to ensure your MINI is perfect for you on the day of collection. Whilst our service is not exclusively available to young & young at heart ladies, (we frequently sell to men too), Mrs MINI, understands the apprehension that many ladies feel when buying a car. We understand it takes a long time to earn the kind of money you need to own a MINI, and we are known for our patience, understanding, care and commitment to making your purchasing experience the best it can be. Whilst we are delighted when you do make a purchase from us, we also recognise that the “Perfect MINI” for you, may not be in our stock, so we will happily go search for it for you, or perhaps make some changes to one in stock to ensure it looks exactly how you want it to look. In these high tech days, you can contact us the old fashioned way by telephone, you can text us or you can send us an e-mail…. you can leave us a message via our Facebook page too….we try and respond to all promptly, and we really are a friendly bunch, so feel free to ask any questions…. We are happy to talk to you about a part exchange, and have taken motorbikes, jet skis, and even a motorhome in the past, although most come to us with a car to part exchange. We are also happy to buy your MINI back from you, and will always make you an offer when the time comes for you to upgrade. We offer a 6 months warranty with our MINIs which can be extended or amended if you wish to suit your needs. We HPI check all our MINIs so that you can buy with confidence and we can provide you with an HPI certificate too if you wish. You can always find a cheaper MINI, but finding one that represents better all round value for money….. on that point we are not so sure…..